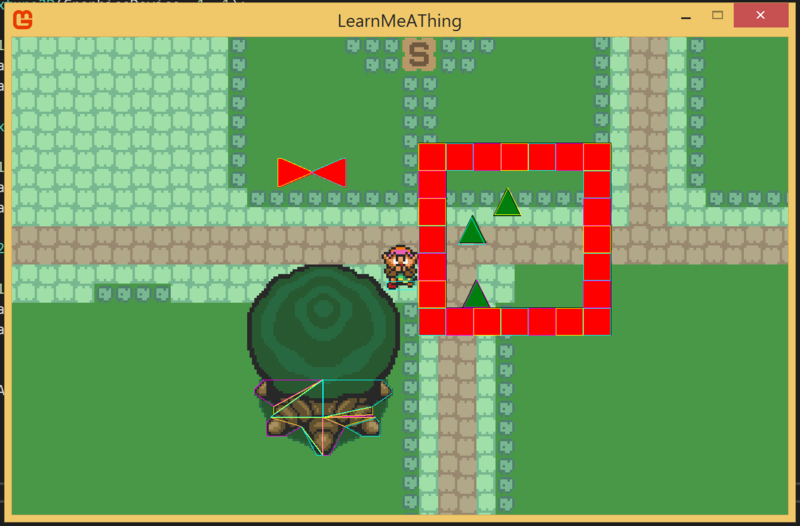 Starting today, tree hitmap polygons appear correct. They also work for collision purposes. The (hopefully) final bug was an error in converting between Cartesian coordinates (used for collision) and screen coordinates (the “source of truth”, used for everything else, including position tracking) – I wasn’t tracking the original height of the decomposed polygon correctly, which resulted in a random-ish vertical translation. There’s a lot to clean up from this work, allocations are everywhere as a sacrifice to debugging expedience. So I’m going to spend a lot of time today cleaning up. A couple hours later, I’m back to no use of System.Collections(.Generic) except for IComparer (since some methods on Array use it). As before, my general approach has been to pre-allocate arrays of a sufficient size and just reuse them. I suspect I’m going to want to make a pass formalizing that pattern (I do already have a Buffer type floating around, but not everything uses it) and maybe switch to an explicit object pool. My goal isn’t to minimize allocated memory, it’s to avoid dynamic allocations in order to keep garbage collections rare and fast. I’m going to switch back to improving the debug overlay, I still need to add some statistics and make it possible to switch overlays without recompiling. I settled on a shortcut of “hold a number, and tap D” to switch them on and off. I had to take a slight detour into text rendering to get the labels in to the top left working. MonoGame has support for some images-as-fonts stuff, but I’ve been avoiding most of the built in stuff (this is a learning exercise, after all) so I rolled my own. It’s just a single texture with characters at an even spacing, so offsetting and rendering are pretty simple. For the moment all that logic is specific to the debug overlays, but I expect I’ll reuse it when I get to dialog boxes. And I’ve now wrapped up a debug overlay that illustrates the time spent in various systems. You can see a graph in the bottom left (4 + D, is the shortcut to bring it up), the black vertical space represents 1/60th of a second and the horizontal is the last 60 updates (which should be about a second). Each system gets a different color to indicate how much of a frame it takes, and a system is only shown if it will be visible in the graph. Currently I don’t capture time spent rendering – I’m still not quite sure how I want to do that since it’s not formally part of the game state like the other systems are. This whole endeavor has endeared me to the Entity-Component-System pattern even more. By structuring all the logic in Systems, it was trivial to get profiling in for this last overlay. The generic-ness of Entities made all the bounding overlays simple as well. Final debug overlay for now, an FPS and render time indicator. This turned out to be pretty tricky, if only because high accuracy timers are non-trivial in .NET and the debug overlay is part of the render loop which complicates the bookkeeping. It updates once a second, and as you can see the current state of things is quite fast! Not all that surprising, given it’s a half-done reproduction of a 27 year old game. Up next, I’m going to go add a bunch more trees to the Kakariko map and see if anything breaks. If everything’s good, I’ll then move onto responding to collisions – right now the bounce code is part of collision detection, it needs to get moved into a separate system and other reactions need to be added.